UPDATED: Wed., July 19, 2017, 1:40 p.m.
SAN ANTONIO – As the clock ticked down on the Spurs’ season and Manu Ginobili was pulled from the game, a thunderous roar from the home crowd guided him to the bench. Ginobili wore an appreciative but quizzical look on his face as he put a warmup shirt back on and prepared to head off into the summer. Clearly, the fans were saying goodbye to one of the most popular players in Spurs history. 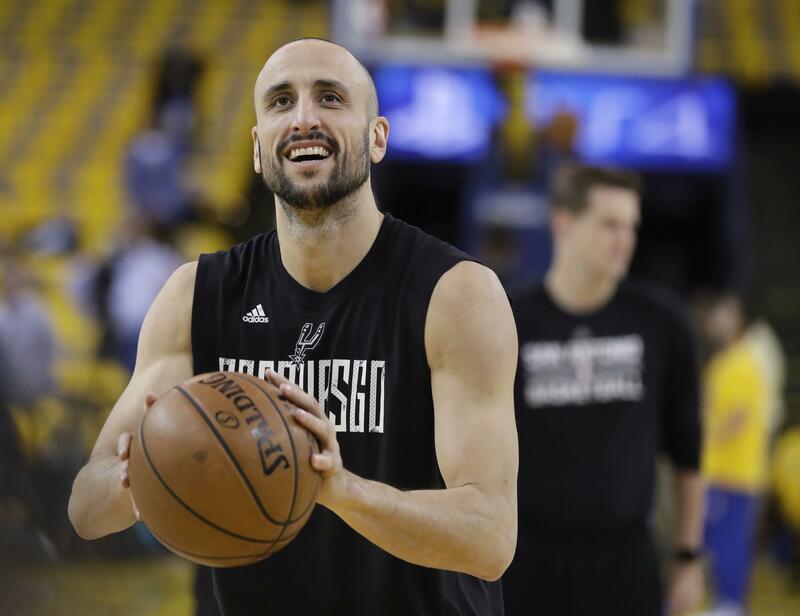 Ginobili was not ready to do the same: The Argentinian posted a message on his Twitter account on Wednesday that he is re-signing with San Antonio for another season, which will be his 16th with the Spurs. Save those goodbyes for at least another year. Ginobili averaged 7.5 points and 18.7 minutes per game last season. In 15 seasons with the Spurs, he ranks in the top five in franchise history in points (13,467), games (992), assists (3,835) and steals (1,349). The 6-foot-6 guard will turn 40 on July 28 and has been a part of four of the Spurs’ five NBA championships. A member of the famed three-player core with Tim Duncan and Tony Parker, Ginobili may be the most beloved member of the group. His heart-on-his-sleeve approach stands out in a quiet Spurs culture and his flair for the dramatic has been an integral part of the Spurs’ success. His overall numbers were down, but he remains incredibly important to the Spurs as they try to chase Golden State in the West. In Duncan’s first season of retirement, coach Gregg Popovich leaned more on Parker and Ginobili to be vocal leaders in the locker room. The Spurs won 61 games last season, but were overwhelmed by the Warriors in the conference finals after Kawhi Leonard suffered an ankle injury in Game 1. After missing out on Chris Paul, they re-signed guard Patty Mills, added veteran forward Rudy Gay and summer league standout Brandon Paul, and are expected to bring back Pau Gasol as well to make another run at Golden State. The understated offseason fits the Spurs more closely than two years ago when they signed LaMarcus Aldridge to a max deal. Given that Parker figures to miss a good chunk of the start of the season with a quadriceps injury suffered in the playoffs and Jonathon Simmons left for a three-year deal with Orlando, Ginobili’s return means even more. Ginobili averaged 13.8 points in just over 20 minutes per game of that series against the Warriors, hitting 58.8 percent of his shots. He said after the final game that “I do feel like I can still play,” and he got no argument from the eventual champions. Published: July 19, 2017, 8:15 a.m. Updated: July 19, 2017, 1:40 p.m.